Not everything on the planet is both durable and comfortable. Producing products that look stunning, are made to last and deliver performance needs innovative thinking, coupled to design flair, together with a decent nod towards understanding the market. International flooring specialist Gerflor have produced a dream of a product that ticks a cornucopia of boxes when it comes to design and substance. Their latest updated LVT acoustic flooring range is bringing the concept of unique styling, coupled to comfort in one single stroke to supply a suite of products that is simply stunning. With over 70 years’ experience Gerflor offer a superb range of flooring solutions which combine technical and design characteristics for any room being specified for a host of differing projects. Colour, design and performance are influencing the way many projects are now being scoped-out, and Gerflor are at the ‘coalface’ of this elemental change in that development. Brand new for 2018 the Saga² collection from Gerflor is a fast track loose lay luxury vinyl tile that provides the durability of a compact tile with the comfort of an acoustic tile. With a wide range of stylish designs available it is suitable for heavy trafﬁc areas including ofﬁces, boutiques, public areas as well as other administrative areas. The on-trend designs and product development of looselay vinyl tiles and LVT”s are fast growing competition for traditional carpet tiles. Saga² is an ideal solution as it minimises dust allergies and is very easy to clean and maintain. Saga² delivers a host of benefits that tells a strong story in terms of specification decisions. Saga² is easy and quick to install and remove as it’s a loose lay tile with tackifier. It’s adapted for raised panels and is extremely durable delivering a 4.6mm thickness with reinforced calandered innerlayer. Saga² comes as a convenient 500.5mm x 500.5mm tile size which also provides ease of fitting. The cork underlayer brings sound impact insulation (15dB) and massive levels of comfort which helps to enhance the ‘feelgood factor’ providing increased levels of both luxury and wellbeing. The other added benefit is that Saga² is also and excellent thermal insulator providing a much ‘cosier’ feel to the under-foot experience. In environments where strong resistance to traffic is needed Saga² provides =0.70 mm wear layer and comes with the innovative Protecsol® surface treatment which means no polish or wax for the entire lifetime of the product, providing easy cleaning and maintenance. Saga² also meets the European slip resistance standard (DIN 51130) and is rated R10 together with holding a Group T wear rating. The stunning new Saga² collection also gets a makeover in the design and aesthetics department where form is as equal to function. 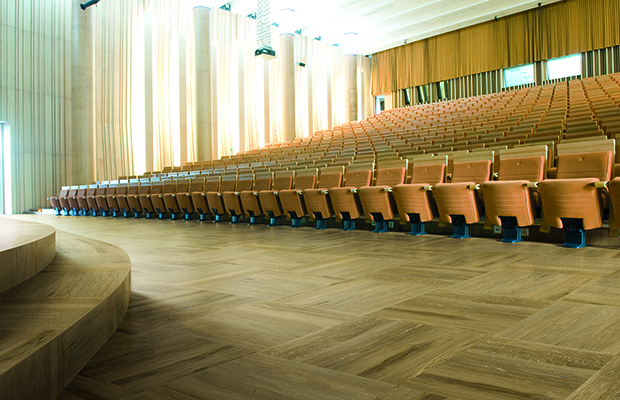 The new Textile, Concrete, Graphic, and Wood groups are composed of 11 Gerflor exclusive designs. Gerflor quite rightly predicted that decorative patterns and designs based on geometric shapes would be the on-trend message for 2018, which they creatively applied to the Saga² Graphic group. Tweed cloth has always been associated with classic hardwearing and stylish bespoke haute couture. It’s this very design maxim that Gerflor have taken inspiration from for their Saga² Textile suite of options where Gentleman Taupe, Gentleman Grey, Gentleman beige and Gentleman Blue take centre stage on the flooring catwalk. The Saga² Graphic group takes a bold step in producing some truly exquisite designs hewed from the influences of chunky, architecturally prominent industrial buildings. The Fiber Copper, Fiber Silver and Fiber Heavy Metal has a strong metal effect which mirrors these strong elemental industrial statements The Concrete range offers realistic minerals, with the Woods references taking their stimulus from Mother Nature herself in producing a natural non-contaminated wood effect. It’s the adage of if it isn’t broken don’t fix it. Barma Mystery, Barma Sweet, and Kadina City in the current Saga² range are quite rightly retained, as they continue to be very popular choices in the offices, retail and administration sectors. With the ecosystem very much in mind Saga² also holds its head high to the environment as its 100% REACH complaint which has a much-reduced impact on our World. Saga² is manufactured from 55% recycled content and at the end of its useful life is in fact 100% recyclable. Good for the customer, good for the end user and ultimately good for the planet.